After more than 2.5 years of spaceflight, and more than 6 months in the asteroid belt, Dawn's interplanetary journey continues smoothly. The mission remains on course and schedule for this expedition to the dawn of the solar system. Our Dawn is not the first spacecraft to use this name, although it is traveling farther from home than any other Dawn. This month two more craft traveled into space carrying that appellation, at least when translated into English. The Japanese Aerospace Exploration Agency sent Akatsuki to Earth's neighbor Venus, and Russia's Rassvet module was attached to the International Space Station in Earth orbit. The solar system is vast, however, and there is plenty of room for all such spacecraft. We send our best wishes for success to these other Dawns as they embark on their missions. While our Dawn patiently and reliably thrusts with its ion propulsion system, gradually reshaping its path around the Sun to match orbits with the protoplanet Vesta, the human members of the team are very busy on distant Earth. Among their many activities is developing the sequences the robotic explorer will use when it begins studying that mysterious, alien world next year. 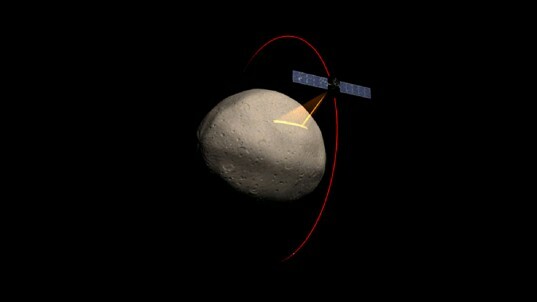 We have seen recently what will occur during the "approach phase" and how Dawn will slip into orbit around Vesta. Now let's have a preview of what the ship will do once it has reached the first science orbit, known as "survey orbit." Engineers are developing those sequences now, for execution in August 2011. In survey orbit, the probe will be about 2,700 kilometers (1,700 miles) above the surface. During the approach phase, navigators will measure the strength of Vesta's gravitational tug on the spacecraft so they can compute the giant asteroid's mass with much greater accuracy than astronomers have yet been able to determine it. (The mass is calculated now using observations of how Vesta perturbs the orbits of other asteroids and even of Mars.) That knowledge will allow them to refine the survey orbit altitude, and they may target it to be somewhat higher or lower, depending on whether Vesta is more massive or less massive than the current calculations show. 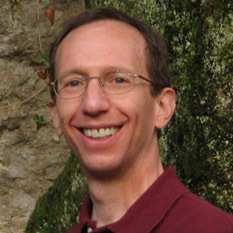 The sequences for acquiring science data are being designed to accommodate a reasonable range of masses. Dawn will be in a near-polar orbit. Its trajectory will take it over the north pole (which will be in darkness, because it will be northern hemisphere winter at that time), then over the terminator (the boundary between the illuminated and unilluminated sides), down over the equator, over the south pole, and then across the terminator again to pass over Vesta's night side. Such an orbit allows the spacecraft to have a view of virtually every part of the lit surface at some time. Each revolution in survey orbit will take 2.5 to 3 days to complete. While this may seem like a leisurely pace, the spacecraft will be busy the entire time. When on the day side of Vesta, Dawn will conduct an intensive campaign of observations. Vesta rotates on its axis in about 5 hours, 20 minutes (one Vestian "day"), which is faster than Dawn will be advancing in its orbit. So from the spacecraft's perspective, as it progresses slowly from north to south, the globe beneath it will complete several turns on its axis. That affords excellent opportunities for mapping the body. During most of approach, Vesta will be so far away that it will fit comfortably in the fields of view of the science camera and the visible and infrared mapping spectrometer. Before Dawn reaches survey orbit, however, it will be too close to capture all of the expansive surface with its sensors in one glance. On each revolution, the sequences will command the spacecraft to point the instruments through profiles that will allow them to observe as much of the surface as possible. The primary objective of survey orbit is to get a broad overview of Vesta with color pictures and with ultraviolet, visible, and infrared spectra. The camera will obtain views with 250 meters (820 feet) per pixel, about 150 times sharper than the best images from the Hubble Space Telescope. The mapping spectrometer will reveal much of the surface at better than 700 meters (2300 feet) per pixel. While subsequent science orbits will yield more detail, these first, new perspectives of this ancient world will represent an exciting step in the exploration of the solar system. Throughout the year at Vesta, gamma-ray spectra and neutron spectra will be recorded with GRaND, and ultrasensitive measurements of the spacecraft's motion using the radio signal will reveal ever greater details of the protoplanet's gravity field and hence its internal structure. Although such information will be acquired in survey orbit, these investigations will benefit most from the lower altitude orbits. Survey orbit is planned to last for 6 revolutions, or about 17 days. For most of the time it is on the day side, Dawn will fill its memory buffers with images and spectra. For most of the other half of each orbit, as it travels over the night side, the spacecraft will transmit those precious data through its main antenna to eager scientists and all others curious about the cosmos who reside on Earth. (Even when the surface below the spacecraft is in darkness, Dawn itself will be high enough that it will remain in sunlight, so its solar arrays will continue to provide electrical power.) There is so much to see at Vesta, and the instruments generate so much data, that a simple strategy of filling the memory on the day side and emptying it on the night side would be too limiting. Therefore, in the middle of its second, fourth, and fifth passes over the sunlit side, Dawn will halt its acquisition of data to spend a few hours radioing some of its findings to Earth, making more room for subsequent measurements. Because the program of activities during the residence at Vesta is so full, and it all has to be planned in detail long before Dawn arrives, the project needs plans that are resilient to the inevitable problems, both large and small, that arise in such complex and challenging endeavors. While every observation in survey orbit is of interest, many more are scheduled than are necessary to fulfill the scientific objectives. Therefore, even if some are missed because of glitches in systems on the spacecraft or on Earth, as long as others are acquired, the mission will proceed. With the extremely rich set of measurements planned, there is no intention of repeating some that are lost. After it has completed its survey of Vesta, Dawn will resume thrusting, spiraling down to its next science orbit for an even closer view. We will learn more about that in a subsequent log. Meanwhile, as the craft continues to propel itself toward its destination, traveling farther and longer than ever, it will pass 3 milestones on its journey next month. Look for a NASA news release soon on a record it will set as it keeps thrusting with its ion propulsion system. We will describe that in the next log. On June 23, Dawn will have been in flight for 1,000 days. No doubt readers will enjoy taking a minute (at least, for those who read 61,000 words per minute) to reread all the logs since launch to recall some of what has occurred so far during the mission. While much has already been accomplished, the great rewards lie ahead, as Dawn pushes deeper into the asteroid belt, where it will explore faraway new worlds. On June 3, Dawn will be exactly twice as far from Earth as Earth is from the Sun. Of course, the distance between the planet and the star does not matter for the spacecraft; it is on its own independent journey through the solar system. Nevertheless, such an occasion may provide some terrestrial readers with another opportunity to reflect upon the nature of such a journey. Dawn's trek is not simply that of a robot in space. Although in a narrow sense the ship is sailing the cosmic seas on its own, there is much more to the voyage than that. Such a mission represents a journey by a remarkable species that does not allow its physical confinement to the vicinity of its home planet to keep it from reaching ever farther in its pursuit of knowledge and its quest for grand and noble adventures. Dawn is 1.96 AU (293 million kilometers or 182 million miles) from Earth, or 760 times as far as the Moon and 1.93 times as far as the Sun. Radio signals, traveling at the universal limit of the speed of light, take 33 minutes to make the round trip.